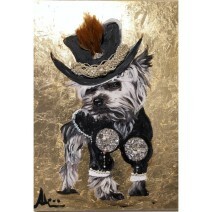 SOLD "Party Dog Ready To Go" Mixed media on canvas by Albin Albinini. 60x80cm. "Icons"
Title: "Party Dog Ready To Go"